White Chocolate Cranberry Cookies are melt-in- your-mouth, soft and chewy buttery cookies overloaded with white chocolate and cranberries. White chocolate and cranberries are one of the best flavor combinations ever! Now, imagine a bunch of sweet and tangy dried red cranberries and white chocolate chunks held together with rich and buttery cookie dough. WOW! 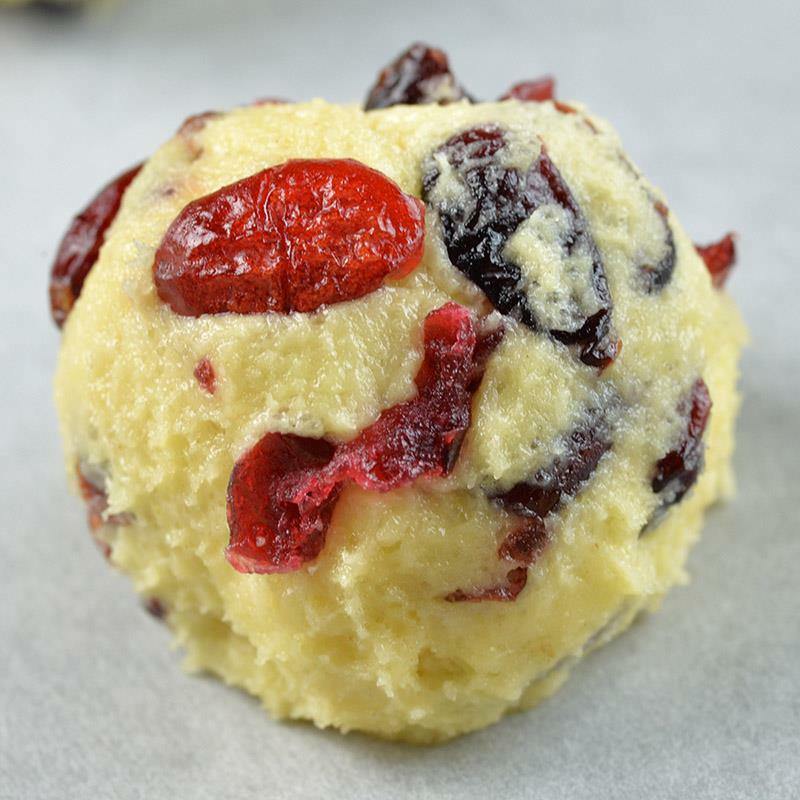 And I bet you won’t be able to wait holiday baking season to try this White Chocolate Cranberry Cookies recipe! But, why should you?! You could bake these yummy cookies right now! Finally, they are dressed up for holidays. Cranberry cookies will look great at your Thanksgiving dinner, they are perfect for holiday cookie exchange or as a homemade gift. Even Santa loves these. If you leave White Chocolate Cranberry Cookies for him on Christmas Eve, don’t forget a tall glass of milk, because these cookies are very, very rich!!! Best thing about food blogging is that you have the perfect excuse to eat delicious desserts any time of year, claiming that you simply have to present to your readers the variety of recipes for the holidays that are perhaps weeks or months away. Also I have a very, very long wish list for Santa this year, so I’ll have to leave him a tray overloaded with awesome cookies and a gallon of milk. He will be very exhausted while fulfill all my wishes, and who knows maybe he remain stuck in the chimney with all that gifts for me. I’ll have to show him my goodwill so I set myself a challenge to find THE BEST CHRISTMAS COOKIES FOR SANTA this year!!! I’m sure he will like these cookies as well as my Soft Chocolate Chip Cookies! I wanted to start the season with these awesome White Chocolate Cranberry Cookies. Red color of the cranberries makes the cookies look really festive. And not to mention the taste! 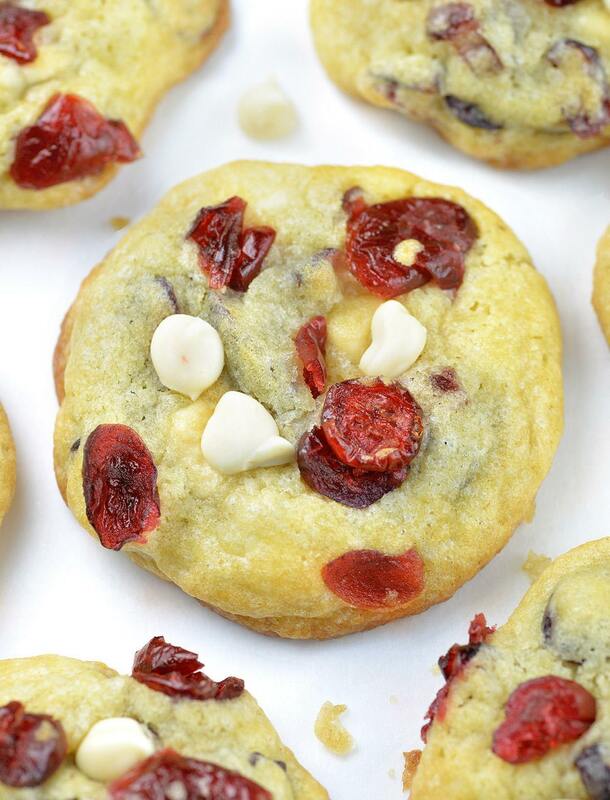 These yummy cookies simply bursting of cranberries and white chocolate. I know I sound like a broken record, but I just prefer to bite real white chocolate in cookies more than white chocolate chips so I loaded these cookies with chocolate chunks, as I did it with my Strawberry Cookies or Apple Snickerdoodle Cookies. Although I have to admit, chips looks better than chopped chocolate chunks so I top each cookie with a few white chocolate chips, just for prettier presentation. 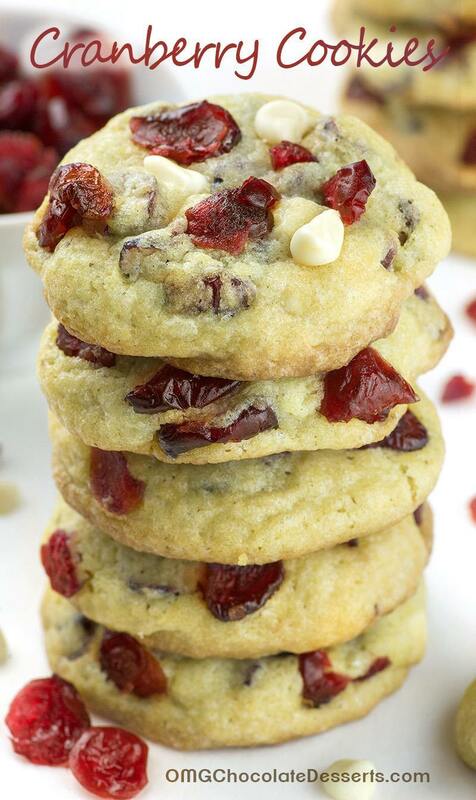 Whether you use chips or chunks, white chocolate matches perfectly with dried cranberries and you’ll love these White Chocolate Cranberry Cookies. Get ready for baking, many delicious CHRISTMAS COOKIE RECIPES are coming soon!!! Craving for more Christmas Cookie recipes!!! Make the classic shortbread cookies with red bits of Maraschino Cherry and you will get beautiful Christmas Cookies – Maraschino Cherry Shortbread Cookies. 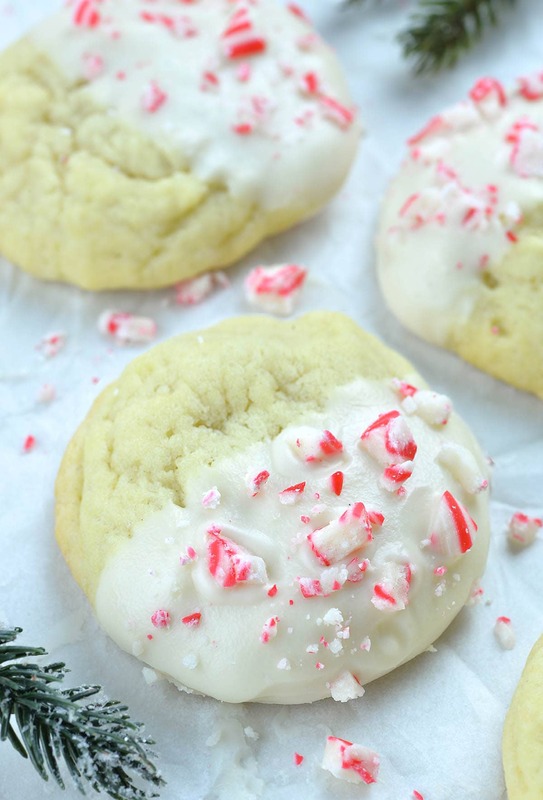 Peppermint Crunch Sugar Cookies are easy Christmas cookies that will make a festive addition to your holiday cookie plate. 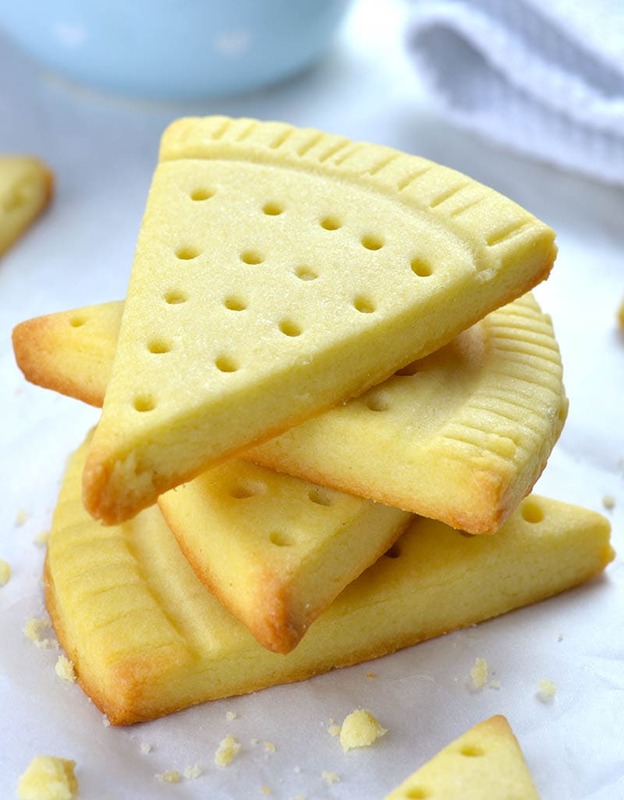 Easy Shortbread Cookies Recipe is delicious and easy to make dessert, snack and traditional Christmas treat. 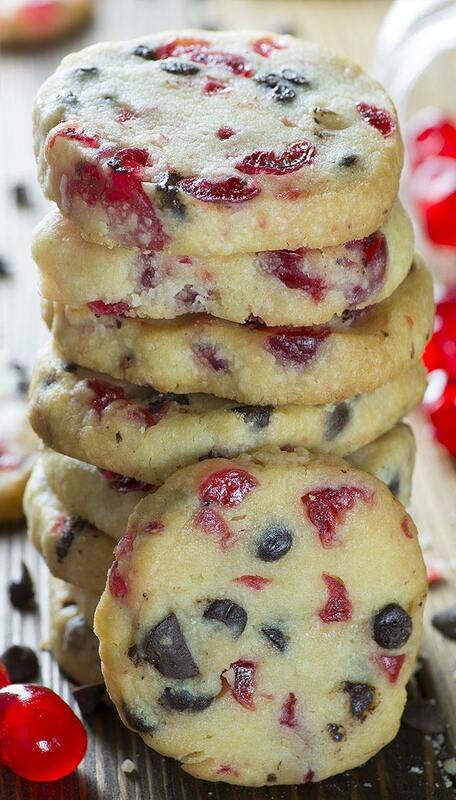 Soft and chewy buttery cookies overloaded with white chocolate and cranberries. In a small bowl stir together flour, corn starch, baking soda and salt. In medium bowl beat butter until creamy and smooth. Add sugar and mix until light and fluffy. Mix in egg and vanilla. Turn mixer on low speed and add in flour mixture. Dough will be thick. Add white chocolate chunks (or white chocolate chips) and cranberries. Mix a few seconds just to combine. Cover the dough and place in the fridge for two hours. Preheat oven to 350 F and line 2 baking sheets with parchment paper. Remove the dough from the fridge and after 5-10 minutes siting on room temperature, scoop out heaping tablespoon of the dough and roll into a ball. Can you leave this cookie dough in the refrigerator over night and cook the next day? Hi Emily, you could do that. Just let it sit on the counter for a while before scooping. These are best with fresh cranberries! Any idea if they can be frozen? Hi Mary, I haven’t tried to freeze them, but I think it would work just fine. I was looking for a Christmas cookie recipes for my jobs Christmas party bake off and came across this recipe! These cookies look simple to make and very delicious! Thanks for posting this recipe! Looking forward to making these for the party! Thanks Brittany! Happy baking ! The cookies look lovely. Mine were a bit “cakey” for my taste. The texture was more like a shortbread than cookie. Might have something to do with the lack of humidity in the winter air. However, with a cup of coffee…the best breakfast ever!!!!! These cookies were so delicious! We all are not big fans of white chocolate, but loved it in these cookies. I definitely had to keep them in the oven longer – more like 14 min. Also I tried this recipe as in and adapted it for my mom who is gluten free. All I did was substitute the flour for the 1 for 1 gluten free flour and they taste just as delicious! Hello Raquel I’m thinking of skipping the corn flour too as I think I haven’t any now. How did your cookies turn out? Can I skip corn flour? Hi Lorna, it’s corn starch not corn flour. You can substitute with all purpose flour. Corn starch makes cookies softer, but it will be OK without corn starch! !